The faces are rounder. The dark, wide set eyes in them are friendly. The mouths smile easily. The people here are shiny and happy. The border is hectic but manageable. Marimba is played so loudly beside the counter where you fill out the visitor’s form that you have to think to remember your name. Fees are paid. Some, like the the tax at the bridge administered by a woman not in uniform with a random pad of paper receipts, seem dubious. Guatemala looks like we both imagined. Green, hilly. Spectacularly green, as though it were Irish and optimistic. The moon is eight months pregnant and will soon be full term. Ducks from a lake a kilometre hence make long low chirping sounds. At Hostal y Camping el Paraiso, our host Juan has taken us on a hike to see howler monkeys, which we can hear but not see, so far. He has shown us some authentic Mayan artifacts that he has in his possession, as well as an array of hanging turtle shells. He is also very proud of his property, and of his money collection, which he painstakingly shows us bill by bill. He is very proud of his three encased Canadian coins, a penny, nickel and dime. He has mined a small cave on his hillside hostel. 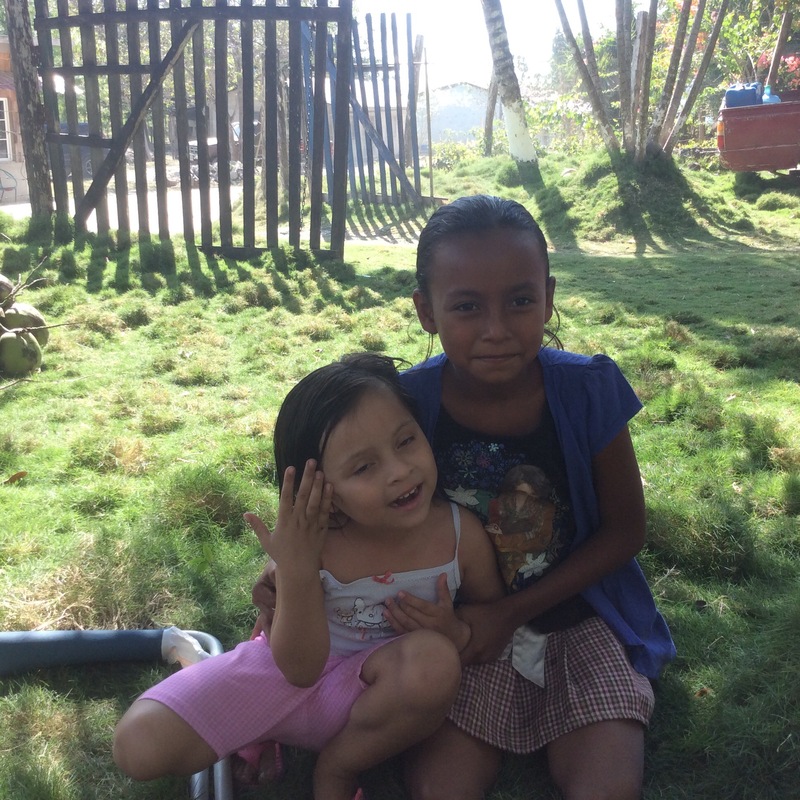 His granddaughters, four year old Catalina and her cousin, nine year old Maria, are adorable little charmers. They love our truck and play and explore it incessantly. Particularly, they love our lawn chairs and folding table. They follow us around, playing with the dog and demanding that we return to the truck so that they may play with the table and chairs. They try on my hat. They spray us with water. Pigs wander lazily, contentedly around the town, on the road. Pigs saunter across the highway. Trucks stop for them. A sleeper pothole has claimed their rim. It is badly dented on both sides. It cannot be repaired. It is Easter Sunday. Easter is the biggest holiday of the year in Latin America. We are told that the nearest shop is a few kilometres up the road. They drive on the doughnut spare. We follow. They pull into a tire repair place and pull away. No one there. Another one. No one there. Matt and I knock on the door of the adjacent house. No answer. Below the four poles and tin roof that, together with a concrete pad, comprise the repair shop, there is another house. We stroll down the hill to find a family. I explain that we need help with a tire. A thin young man passes a baby girl to a young woman. He starts walking in our direction and stops to find a shirt. We turn and head back up hill, followed by the young man, three young women, and an older woman. And the baby. The young man examines the wheel. He flips it over carefully, searching with his eyes. He runs his hand around the perimeter of the rubber. He picks up what looks to be a large sledgehammerish looking mallet. It is about three feet long and made of maybe two inch pipe. The head is flat and maybe slightly rounded on one end. Standing on the tire, he begins to expertly pound on the rim. The wheel awkwardly skids in the gravel as he works at it. He is quick and focussed. He checks his work often with eyes and hand. He pounds. He flips the wheel over and continues. He is adroit with this large clumsy tool. He never looks up. Matt goes to remove the doughnut wheel. The women follow. They stand twenty feet back, watching Matt with womanly interest. They smile and laugh quietly. Matt has a fan club. In less the fifteen minutes, the unfixable wheel has been hammered back to function. It was an inch out of true on both sides. Rubber sealant is applied and the tire, somehow undamaged, is re-inflated. The women catch a collectivo bus and make a point of saying “bye” in English. The tire is mounted and we are on our way. I am impressed by the skill. I am impressed by the practical solution. I wouldn’t have believed it unless I saw it it with my own eyes. Previous Previous post: On the Chicken Boat!